The Fujifilm GFX 50S Medium Format Camera delivers an exceptional image quality. It combines a resolution of 51.4 megapixels with exceptional tones, advanced colour reproduction and high-performance lenses. The GFX 50S features a 43.8 x 32.9mm CMOS Medium Format sensor - boasting an effective resolution of 51.4 million pixels and paired with the new GF lenses, the sensor has the ability to deliver superior tones and sharpness. The lowest native ISO sensitivity of 100 and the 14-stop dynamic range is achieved with 14-bit RAW data, which delivers high definition images in a variety of conditions. 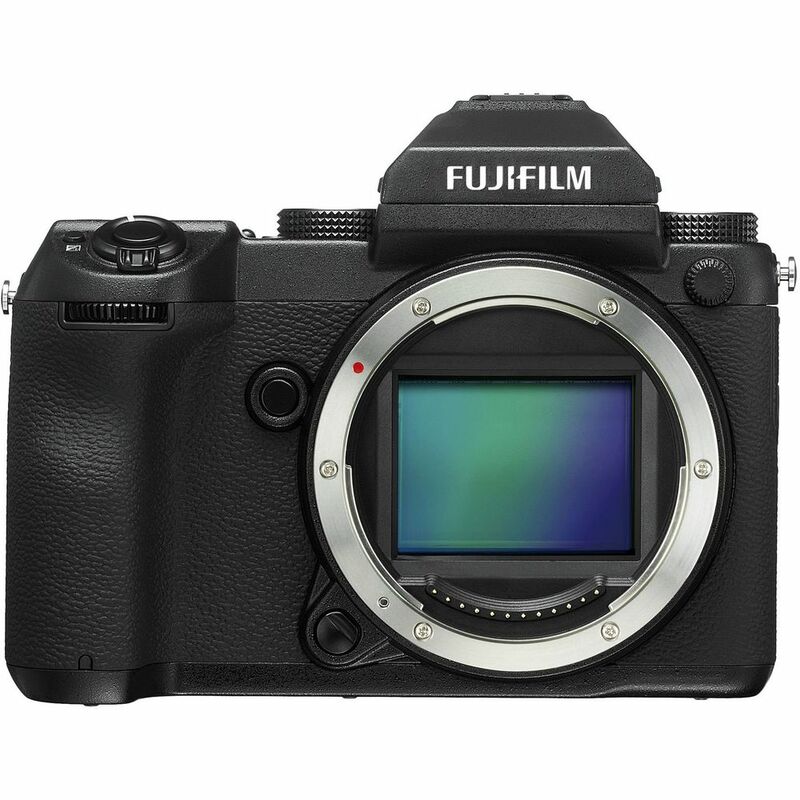 The Fujifilm GFX 50S features the X-Processor Pro image processing engine. It's advanced processing exceeds and optimized the camera's performance in a variety of areas including the stunning colour reproduction with Fuji's unique Film Simulation modes, in-camera RAW conversion to the 8-bit TIFF format and accurate contrast AF. The Fujifilm GFX 50S saves pictures in a variety of formats and quality, including two sized and three compression levels of JPEGs, as well as compressed/uncompressed RAW. Even when just shooting in RAW alone, the camera records 12-megapixel thumbnails at the same time. It's in-camera RAW conversion function also enables RAW files processing with the ability to save them as 8-bit TIFFs. The standard ISO sensitivty range is ISO 100-12800 with extended sensitivities of ISO 50, ISO 25600, ISO 51200 and ISO 102400. RAW format is supported ar all these ISO settings. The AUTO function allows you to set the standard ISO, low shutter speed limit and upper ISO limit. Film Simulation allows you to reproduce a variety of colours and tones as if using different photographic films. These include; PROVIA, Velvia, ASTIA, CLASSIC CHROME, PRO Neg.Hi, PRO Neg.Std, ACROS, MONOCHROME, SEPIA, Grain Effect and Colour Chrome Effect. The body of the GFX 50S is made from robust magnesium alloy, which feels both solid and durable in the hand. The body is weather-sealed in 58 points to achieve a high level of resistance to dust and moisture. The GFX 50S is compact and lightweight despite the large size of its sensor, plus its dust and weather--resistant body means its equally effective in the studio or out in the field. The Fuji GFX 50S is supplied with a detachable 3.69M-dot EVF with 100% coverage and a viewfinder magnification of 0.85x. It uses five dedicated lens elements to achieve 100% coverage and offers a diopter adjustment range of -4m-1 to＋2m. Attach the optional EVF Tilting Adapter EVF-TL1 between the camera body and the EVF to enable vertical tilt (0°-90° / 5 steps) and horizontal rotation (±45°). This electronic level uses a 3D system and is highly effective for architecture or landscape photography, when the accuracy of horizontal and vertical lines is crucial. The rear 2.36M-dot LCD monitor measures 3.2 inches and offers 100% coverage. The smart touchscreen panel enables intuitive operation and tilts in three directions for easy framing. For more accurate focusing, push or rotate the Rear Command Dial to enlarge Live View images between 1x and 16.7x. The 1.28-inch monochrome LCD monitor can be viewed in all conditions and displays information including shutter speed, aperture, ISO, exposure compensation and exposure mode. You can customize up to 8 items to be displayed on the monitor. The Fuji GFX 50S uses the G Mount, which has a mount diameter of 65mm and a minimum back focus distance of 16.7mm. It uses as many as 12 electronic contact points for sending and receiving dara, plus it supports the use of a wide variety of lenses and accessories.